A long long time ago, when Minecraftia only just began it’s existance. There were chickens. And these chickens layed eggs. But try as you might, nobody has ever been able to eat them and get to that creamy yellow yolky goodness. Those agonizing days are forever gone! Using our new advanced chicken modifying techniques, we’ve been able to genetically modify all chickens to lay edible eggs! These eggs can be baked. That’s right! Just pick up the egg and stick it in a furnace. And all that delicious eggy yummyness will be yours. To use this mod you will have to have Minecraft 1.6.4 or 1.7.2 installed with the right version of Forge for this mod to work. Download the Forge installer for your version of Minecraft here. Once you’ve ran the installer and ran Minecraft at least once. 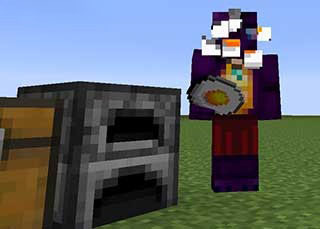 (Just run it and quit, you don’t need to make a world), copy the eggygoodness modfile you’ve downloaded here and drop it in your Minecraft’s mods folder. If this is all too complicated for you, you can also use MultiMC to install Minecraft and Forge and use it to load this mod. When your Minecraft crashes on startup or you get error messages about conflicting ID’s, please open the EggyGoodness.cfg file in the config folder of your Minecraft installation and change the number inside it to a free number. Just make a number up if you don’t know which ones are free and see if it works now. If not, rinse and repeat. You can pick any number from 4097 to 32000. Tinker’s Construct has it’s own smelting recipe for of course inferior so called ?Fried Egg’. The recipe for their eggs clashes with ours and unfortunately there is nothing I can do to fix that. If you use Eggy Goodness, don’t install Tinker’s Construct.